Fresh homemade ricotta is nothing like the stuff you get at the supermarket. You can taste the difference; it's fresher, richer, and all around more delicious. The good news is that you do not need any fancy equipment, hard to acquire cultures, or expensive ingredients. This recipe uses ingredients you probably already have at home with tools you regularly use in your own kitchen. You can add this ricotta to your famous lasagna or spread it over some crostini for a simple snack. However you use it, I am sure it won't take long for the ricotta to disappear. Stay tuned for a post on ricotta recipes. Pour the milk, cream and salt into a saucepan. Using a thermometer, heat the milk to 190°F, stirring it occasionally to keep it from scorching on the bottom. Remove the pan off the heat and add the lemon juice, then stir the mixture a couple of times. Leave the milk mixture to sit for at least 5 minutes (it will start to look curdled). Line a colander with two layers of cheesecloth and place it over a large bowl (to catch the whey). Pour the mixture into the colander to allows the curds seperate from the whey. This will take at least an hour. After an hour, you will have a spreadble ricotta. If you desire a firmer texture, let it sit for another hour. 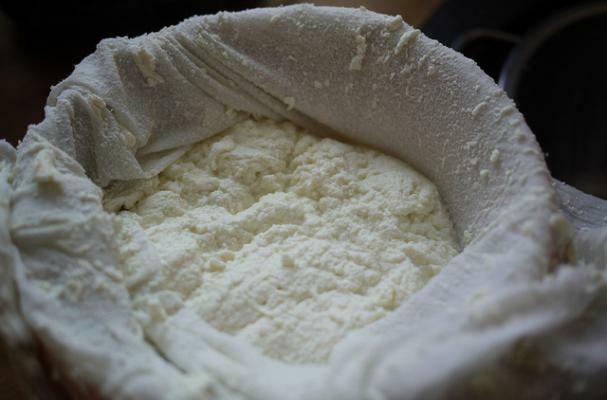 Transfer the ricotta to an airtight container and refrigerate until ready to use.